Ashland is unique is so many ways. One of the most powerful ways is in its spirit of community partnership. These foundational partners work together daily to ensure that the flow of information is unobstructed. This partnership is facilitated by the Ashland Chamber of Commerce under the name of the Ashland Coalition. Several years ago we approached the coalition to seek approval to be a part of this unique idea, TodayInAshland. The plan was that Project A would stand up and support a free community portal for the community where we live and work while allowing us to integrate their calendars into the portal so that the citizens and visitors had only one place to go to see everything going on in the community. 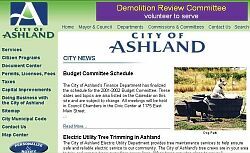 Over time we have developed a dynamic database driven calendar tool that many of the partners have even integrated into their websites to make them more functional and easier for us to publish in TodayInAshland. We are proud to be partners with our community in bringing you this portal.